Can You Solve The Puzzle Of The Overflowing Martini Glass? Welcome to The Riddler. Every week, I offer up a problem related to the things we hold dear around here — math, logic and probability. These problems, puzzles and riddles come from lots of top-notch puzzle folks around the world — including you! You’ll find this week’s puzzle below. Mull it over on your commute, dissect it on your lunch break, and argue about it with your friends and lovers. When you’re ready, submit your answer using the form below. I’ll reveal the solution next week, and a correct submission (chosen at random) will earn a shoutout in this column. Important small print: To be eligible, I need to receive your correct answer before 11:59 p.m. EDT on Sunday — have a great weekend! Before we get to the new puzzle, let’s return to last week’s. Congratulations to 👏 Enrique Treviño 👏 of Lake Forest, Illinois, our big winner. You can find a solution to the previous Riddler at the bottom of this post. Now here’s this week’s Riddler, a cocktail puzzle that comes to us from a philosophy professor who wishes to remain anonymous. Cin cin! It’s Friday. You’ve kicked your feet up and have drunk enough of your martini that, when the conical glass (🍸) is upright, the drink reaches some fraction p of the way up its side. When tipped down on one side, just to the point of overflowing, how far does the drink reach up the opposite side? Need a hint? You can try asking me nicely. Want to submit a new puzzle or problem? Email me. And here’s the solution to last week’s Riddler, concerning the buttons pushed in a crowded elevator. Given N people equally likely to press any one of M elevator buttons, you can expect M-M(1-1/M)^N of the buttons to be lit up when the elevator begins its ascent. Here’s one way to get there: First, consider the probability that a given button is not pushed by anyone. The probability that any one rider doesn’t select a given floor is (M-1)/M, so the probability that a given floor is selected by no one is ((M-1)/M)^N. Put another way, the probability that any given floor is pressed by someone is 1-((M-1)/M)^N. 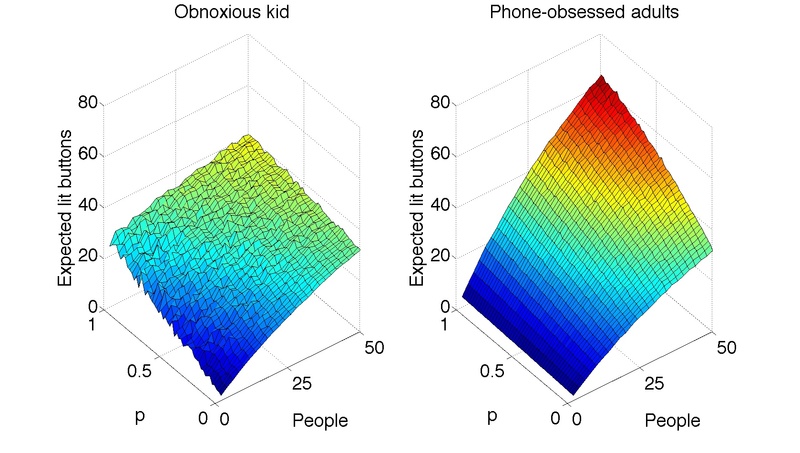 This is true for all the buttons, independently of one another, so the expected number of pressed buttons is M multiplied by that probability, or M-M((M-1)/M)^N. A little rearranging for simplicity’s sake and we arrive at our answer: M-M(1-1/M)^N. Some great extensions this week, too. Randi Goldman turned the problem upside down, and explored how the number of people affected long, Tower of Terror-style elevator drops. In his answer submission, Don Barkauskas noticed cleverly that if riders are willing to walk one flight of stairs, and so won’t press a button if the button for an adjacent floor is already pressed, the problem morphs into the misanthropic neighbors Riddler! Happy Friday the 13th, and may your weekend be un-obnoxious and phone free. It’s beautiful outside!